Back in January, we learned that if you want to be a developer and avoid leaving money on the table, you need to be on both Android and iOS. One or the other isn't going to cut it. However, according to AppAnnie, if you have to choose just one platform, Android is still struggling to prove it's the one you should go with. 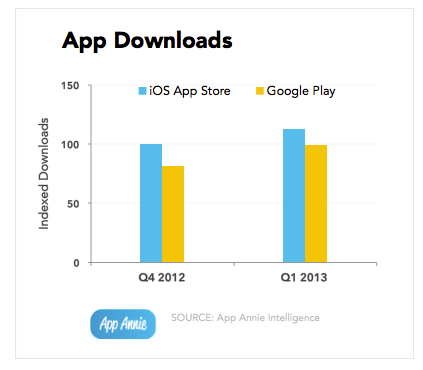 According to the report, Play Store downloads are nearing App Store levels, reaching close to 90% as much as the iOS store. Unfortunately, equal exposure isn't quite translating to equal revenue. 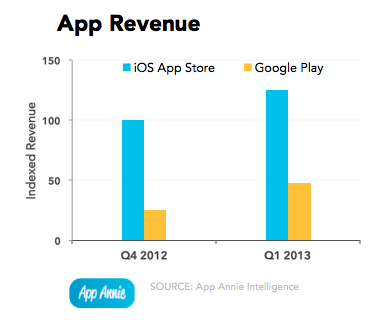 As it turns out, Apple's platform is still bringing in about 2.6 times as much revenue as Google's counterpart. It's not all bad news. That gap is a lot smaller than it was the previous quarter, when iOS developers brought in 4x the revenue of Android devs. Part of that may be due to Apple's above average holiday quarter, though. Regardless of the reason for the scale, it's still a problem for Android devs. So, why is this happening? Well, according to the report, games are a significant driver for revenue, accounting for 70% of iOS and 80% of Play Store cash. Though, with the App Store pulling in 240% of the money Google's devs are, leading Apple by 10% on this metric still leaves the devs with less than half the money available on iOS. Of course, the alternatives to these two platforms—like Blackberry or Windows Phone—still lag far behind either in terms of sheer number of apps available or revenue generated. However, developers can take a couple things away: a.) 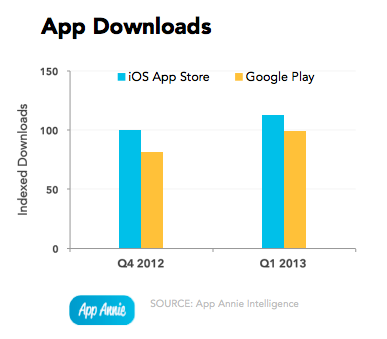 there is virtually no distinction between the absolute sizes of the iOS App Store and the Play Store anymore and 2.) the business models for making money on Android are nowhere near optimized. Either that or the old stereotype that Android users are inherently cheap is true. But we'd hope that at least some folks out there can prove that adage wrong.